Then, players decide their actions for the turn, deploying their apprentice work force to various tasks. You'll need to buy paint, mix paint, work on painting the fresco, raise money (which you'll need to buy the aforementioned paint!) by painting portraits, and perhaps even send your apprentices to the opera in order to increase their happiness. Points are scored mostly by painting the fresco, which requires specific combinations of paints, so you'll need to buy and mix your paints wisely, in addition to beating other players to the paints and fresco segments you would like to paint. 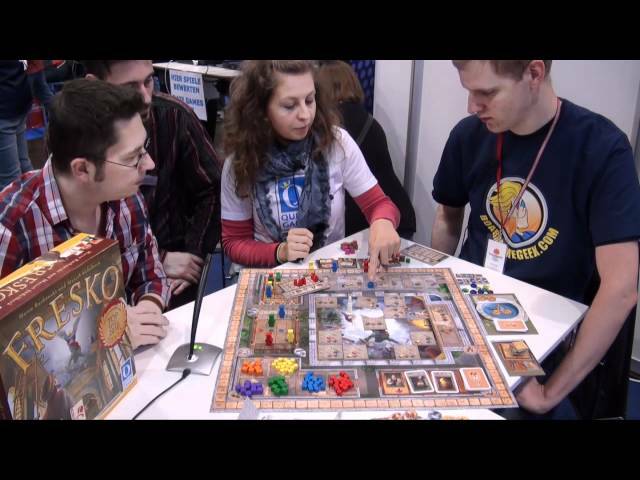 Fresco includes several expansion modules, so you can play without expansions for a lighter family game or add in expansions to vary play and increase the decision-making and difficulty, resulting in a very flexible game with a high replay value. Noble Knight GamesFresco Collection - Base Game + Modules #1-7! Fresco Collection - Base Game + Modules #1-7!